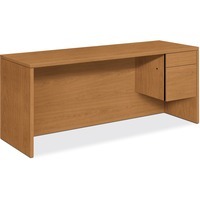 HON 10545R Credenza HON10545RCC $446.99 Harvest laminate credenza with a 34 pedestal is a part of HON 10500 Series Wood Laminate Furniture that complements many furniture designs. This single pedestal credenza features one box and one file drawer. Locking drawers offer five sided construction for easy drawer alignment. The interchangeable, core removable lock makes rekeying quick and easy. Box drawer operates on ball bearing suspension with 34 extension while the file drawer extends fully on ball bearing suspensions. Included hangrails are designed for side to side letter size or legal size filing and front to back letter size filing. Top and end panels are made with durable, thermal fused laminate over durable, 1 18 thick, solid core high performance particleboard and resist warping, scratches and stains. One cord, pass through, 3 grommet in the top center of the formal, full height modesty panel is designed to reach electrical wall outlets while routing and hiding wires and cables.